Fortes (later Trusthouse Forte) were a hospitality giant and the leaders of the roadside market before being bought out by Granada. They owned hundreds of restaurants and planned many services. Before motorways, they ran many hotels and cafés around the country. Their first business was a milk bar in 1935. Owing to their heritage as a hotel and restaurant chain, they took the catering at their services very seriously. While they weren't flawless, at a time when their competitors were struggling to serve anything edible, Fortes were usually considered "the best of a bad bunch". Inside one of Fortes' grill restaurants. Keen to promote their name, Fortes wanted to get involved in the motorway game from the start. They proposed designs for both Watford Gap and Newport Pagnell, focussing on providing the highest service that would show their name in a good light. At Watford Gap, they were marginally pipped to the post by a more competitive tender, but at Newport Pagnell they won the contract and created a design which went on to be used as a benchmark across the country. Fortes' first few services were actually operated by Motorway Services Ltd, a joint venture between Forte (92%) and Blue Star (8%). The latter were responsible for the fuel and recovery parts of the business, while Fortes took control of the catering and prestigious operation of the main site. The two got together to cover all parts of the industry and promote their names. The black-and-white logo was replaced by this blue one. This business name is perhaps the source of the linguistically unusual phrase "motorway services", even though both companies opted to use their own names publicly. Motorway Services Ltd made strong bids for all the early services. Monopoly regulations prevented Motorway Services Ltd from bidding for Lancaster, so Forte did it under their own name and claimed they were an entirely new operator. After struggles to open Keele and Charnock Richard, directors of Motorway Services Ltd opted to sit back for a while and instead Forte bid to operate services entirely by themselves while Blue Star found new partners. 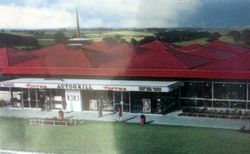 Fortes Autogrill was the name used for some large Fortes restaurants, built besides major roads, such as at Peartree and Barnsdale Bar. These were based on the success of their motorway sites, and were soon brought under regular Fortes motorway branding. The blue logo used with the 1980s name. Early Forte services included an American-styled restaurant called Grill & Griddle, and in many cases, seating available along the bridge to provide a good view of the road. They then moved towards a Scandinavian theme, making heavy use of visible wood in their building designs. While Rank and Granada were desperate to win the early contracts, Fortes' efforts were considered to be consistent and patient. Fortes went on to build several more services, before merging with Trust House, who had been running rest areas long before motorways were heard of, to create Trust House Forte and later Trusthouse Forte. The company's hotels were re-branded as Forte Posthouse. This made Forte the UK's largest service area operator for the next 20 years. 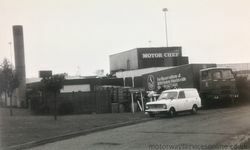 In 1974, they changed the name used by their services to Motor Chef. This was deliberately made very similar to Forte's Little Chef, as if the services were the bigger brother of the restaurants. This change was quickly undone. The THF logo was applied to Forte brands. Lord Forte was very keen on the American principle of giving one operator a monopoly of the catering on an entire road. This doesn't really work with Britain's inflexible motorway network. Fortes became particularly frustrated with government taxes and briefly, in the 1970s, refused to build any more services. Instead, they considered a national network of motels and off-motorway lorry parks, which didn't go ahead. In the early 1980s Forte introduced shops selling sandwiches and a few groceries, branded Piknics. Its logo was an umbrella. They replaced un-branded cafeterias with The Granary, Little Chef and Julie's. 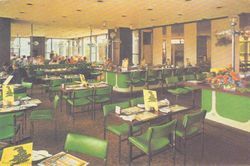 At this point their services had a green colour scheme, with slogans such as "a choice of good eating" and "the finest food on the motorway". Having owned Little Chef since 1960, in 1986 Trusthouse Forte bought Happy Eater and the four Welcome Break services off Hanson Trust, for which they were referred to the Monopolies Commission. 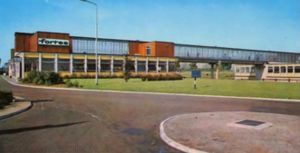 At the time Trusthouse Forte described Welcome Break as 'highly respected', so they decided to re-brand all their motorway services as THF Welcome Break rather than do it the other way round (in reality, using the Welcome Break name meant Forte could distance their highly reputed brand from the notorious motorway market). This meant an end to Forte-branded services, but they continued to own Welcome Breaks and several other chains. By now Forte and its brands were the only operator to be very satisfied with the way the government regulated motorway services, and were keen to open more, but had to wait for the Clacket Lane high court case to be completed. They introduced budget motels branded Forte Travelodge. In 1993 they bought French operator Côté France from Granada. In 1995, Granada bought Trusthouse Forte for £3.9billion in what was a hostile and controversial takeover. By then, Granada had grown so much that they were forced to sell off Welcome Break, who were picked up by Investcorp. The remaining Trusthouse Forte businesses were changed to become Forte. When Compass and Granada split up (Compass took Granada's hospitality services and Granada kept their media), Forte was handed back to Charles Forte's son Sir Rocco Forte. At the time, Granada said Welcome Break had been starved of money, with profits having dropped over the last few years.